Is it possible to get straighter teeth with adult orthodontic treatment, without the need for metal braces? Wyndham patients may be amazed at the invisible technology of what Invisalign clear aligners have to offer. Invisalign is known as a unique orthodontic system that uses a series of removable clear aligners that fit over your teeth to systematically straighten them. They’re computer-generated, custom fit trays that are nearly invisible when worn. Metal wires and brackets with traditional braces leave most adults wanting to hide out until their treatment is over. With Invisalign, your life can go on uninterrupted – since no one will usually notice that you’re going through orthodontic treatment thanks to the translucent design. Invisalign aligners can be taken out to eat so – unlike traditional metal braces – you can enjoy all of your favourite snacks including popcorn, chewing gum, and sticky taffy. As with eating, you should take your aligners out to brush and floss your teeth. This is super convenient and makes your dental hygiene routine as easy as ever. Traditional braces may need to be worn up to two years, depending on the situation. Most Invisalign cases take between 6-18 months to complete. Each pair of aligners is worn for two weeks. Before you move forward with Invisalign treatment, we can estimate how many aligners your treatment will require, to determine how long your individual experience will be. Everyone will be different. 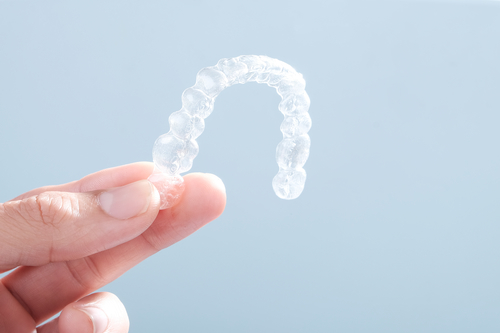 If you’re interested in learning more about straightening your teeth with Invisalign, then call us for a consultation today. The friendly staff of Wyndham Dental has been caring for the community of Wyndham for over 30 years and we look forward to helping you too!